Color reproduction of autograph score of Beethoven's Symphony No.7. The work was composed between the period of September 1811 to mid 1812, and its premiere took place on December 8 at the Viennese Universitätssaal together with the premiere of Wellington's Victory. While two copyist manuscripts survive with Beethoven's markings—one of them the fair copy in the hand of Anton Diabelli prepared for the first edition of the publisher Sigmund Anton Steiner—the autograph produced here in facsimile has a very special place because it preserves to a very great extent the text of op. 92 in its final form. This is the conclusion of Jonathan del Mar, based on the type of corrections and modifications seen in the autograph, modifications that were ostensibly transferred to the score during the first rehearsals. 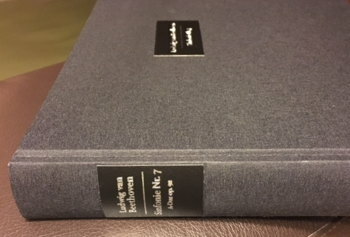 Although Beethoven originally "signed off" on the correctness of Diabelli's fair copy score, Del Mar notes that Diabelli consciously deviated from the text and introduced obvious errors, and concludes that Beethoven had only looked at it superficially. 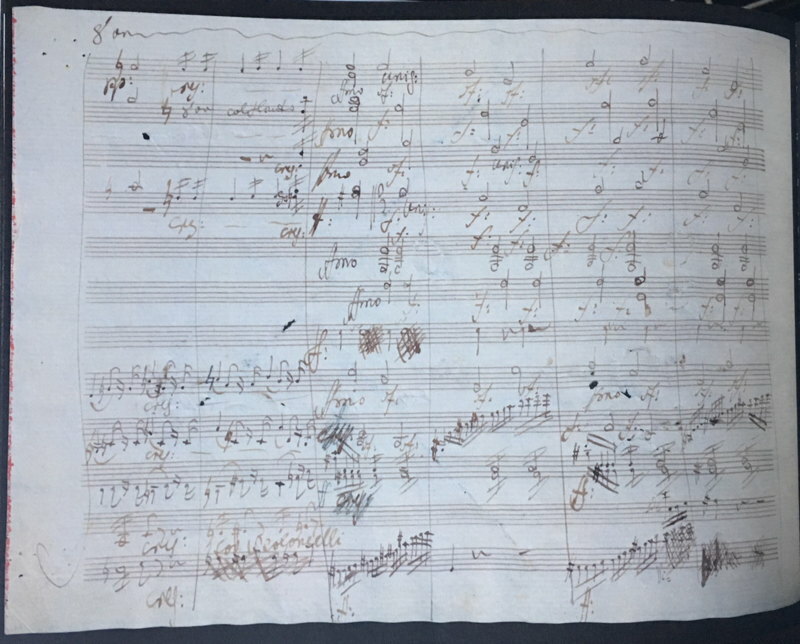 This is corroborated by the existence of an angry letter written by Beethoven to Stein in November 1816 having just received the printed version: "The business connected with this symphony is very distasteful to me... So far, such a defective, imperfect version of a work composed by me has never appeared in this fashion in engraved form. That is what comes of refusing to read the proofs, of not giving me the work to check beforehand, nor reminding me to do so... So far as I am concerned I do not want to hear anything more about that mutilated, crippled symphony...”. Interestingly the traditional notion that a fair copy represents the ultimate and most advanced state of a composition, rendering previous versions secondary, is not relevant here since Beethoven did not see the final proofs. The earlier version of the Op. 92 autograph then serves as the primary and authoritative source for this symphony (along with a first print with handwritten corrections).